The EVCC is dedicated to improving our community’s infrastructure and encourages sustainable transportation including walking, bicycling, scootering, skateboarding, and other human-powered transportation. 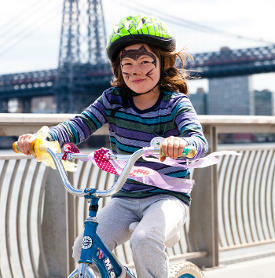 The EVCC’s Fourth Annual Kids’ Art Bike Parade was held Saturday, April 30 in East River Park. Hundreds of children and adults rode art decorated bicycles through our waterfront park. Bike Safety, Learn to Ride, and other bike related workshops were held the day of the Parade. EVCC works with local stores, artists, and other not-for-profit and government organizations on this extraordinary event. The EVCC advocated for Select Bus Service (SBS) on Manhattan’s East Side and for protected bike lanes on 1st & 2nd Avenue. We worked with Transportation Alternatives on the East Side Action Plan – A Community Vision for Safer Streets.